Over the years I’ve upgraded my telephones beginning with a 900 mhz model and then moving to 2.4 GHz, 5.8 GHz and now Dect 6.0. Along the way I also purchased models incorporating digital voice, answering machines and headset jacks. I would have thought that my list of reasons to upgrade had been fulfilled, until I got this unit from VTech. The contents of the box include everything you need to hook to your telephone line. I did have to install the batteries in the handsets and let them charge for awhile. I have patience, so I waited for about 12 hours before I hooked them up. A closer look at the base station with one handset and the headset. The headset charges in the base station and is held in magnetically. Talk time for the handsets is listed as 7 hours and for the headset 9 hours. This was not a problem for me, because I don’t talk that much and I always put the hand/headsets back in the charger when not using them. VTech is smart enough to provide several different ways to wear the headset. There are 3 different earbuds, 3 different ear hooks and a headband if that’s your preference. Personally, I use the ear hooks. It took me awhile to get the best fit, but now it’s comfortable. I usually wear the headset when I’m out in the yard or in front of the computer. 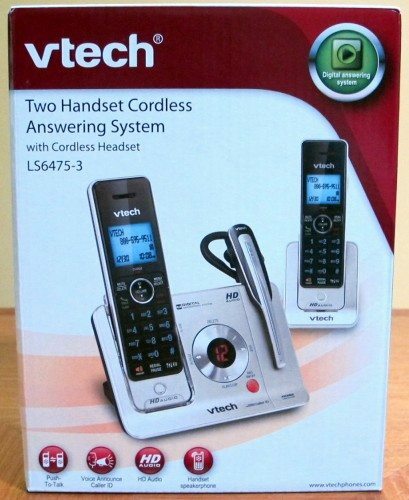 VTech has addressed an issue I’ve had with some cordless phones, and that is sometimes when you put the phone into the charger or base, it really doesn’t make connection with the contacts. As illustrated by the above photo, there is plastic bracket (just above the VTech logo) that ensures the handset is firmly in the base or charger. No more dead handsets or not hanging up the phone correctly. So, now it was time to give this phone a test drive. I hooked the base up to my Ooma voip system and put the extra handset in my bedroom upstairs. Although the answering system capability was redundant, because I have voice mail, I turned it on anyway and set it to answer after 2 rings. This had to be done otherwise my voicemail would have picked up first. All I have to say about the answer system capability is that it was easy to set up, the messages were clear and it is accessible remotely. On the down side it’s less functional than voicemail and it seems like a legacy function considering the increased number of people using their cell or voip for phone communication. Both of these technologies have voicemail as standard. One of the things I learned about myself when checking the telephone out is that I don’t call many people. It’s not that I’m a hermit. I just IM, text and email a lot. Perhaps this says something about me, or maybe it’s just a sign of the times. Also, of those people I do call, they either use a cell or voip as their main number. 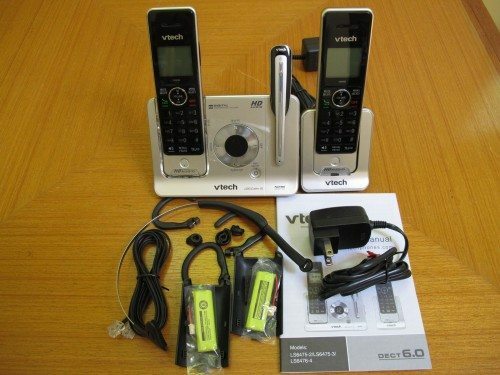 Because cell and voip voice quality is a variable, it was hard to judge quality of the VTech phone. When I made an effort to call a known POTS number, it did seem that the audio was clearer than my older phone. The phone does have an equalizer that allows bass and treble enhancements. The talking caller id seems a little gimmicky to me. The mechanical voice needs some elocution lessons. Some of the announcements were amusing and not at all understandable. However, the correct name and number is on the handset, so I always knew who was calling. The talking caller id only works on the base and handsets. The headset will ring on an incoming call, but it does not announce caller id. Then you have the push to talk function. This makes the handsets act like walkie talkies. It would probably come in handy when there are 3 or more handsets, because you can broadcast to all of them at once. For a 2 handset system I use the intercom function. It allows full duplex conversations. Features I like are the speaker phone in base and handsets; Ability to add caller id numbers to the phone book; Expandability up to 12 handsets; long range (I was able to use the phone 200 ft from the base) and my major selling point is the supplied headset. Using the headset I can answer a call plus change and mute the volume and flash the system to answer a call waiting call. To make a call you have to use a handset and then switch over to the headset. The LS6475 is a functional and attractive telephone system. I’d like to see a similar unit less the answering system because I don’t see the need given the ubiquity of voicemail. After evaluating the unit, I turned of the answering part of the phone and I’m using the Ooma voicemail. I now get notified via text when there is a message and messages are taken even when the line is busy. These features are not available with the answering system. Can you turn off the talking caller Id function? Yes, you can turn off talking caller id. I’m not home to check it out right now, but according to the manual, this can be turned on/off in the setup menu. Seems the biggest feature is the CORDLESS headset. I use an ancient Uniden EBLT with a Bluetooth cordless headset. I think it is Bluetooth vrs. 1.0, and often stumbles with current bluetooth earpieces. And, that old Uniden is the only cordless headset I have been able to find, up until this one. BTW, the cordless phone piece, the one you carry around, is a flip phone so it sits nicely in a shirt pocket. Have I been missing something? Are there others with cordless headsets, which is why you didn’t flag it as a major feature? In the next to last paragraph I say my major selling point is the headset. However, after using the phone since the review I’ve had 2 headsets break on me. 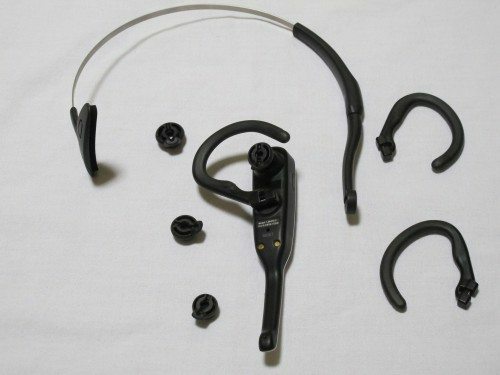 The earpieces and headband hook to the headset between 2 flimsy pieces of plastic that are prone to breaking. I’ve given up using it. 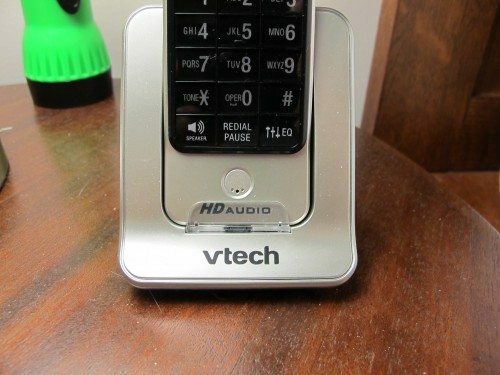 I’m looking to V-Tech because all the Panasonic cordless phones have the voicemail waiting indicator flasher in a bizarre location which is on the top of the phone, but the top is curved so really, the indicator is only really visible when you get close to the phone so you can look down on it. I’d like an indicator that lets you see a voicemail waiting from the front of the phone. Does the indicator on the LCD flash on this phone clearly visible from a short distance away so I can check it in passing or from the other end of a small room? Unfortunately the voicemail indicator is just a small icon on the handset and the words “new voicemail”. It’s not very readable unless you’re looking directly at the display. This is not uncommon with telephones that have built in answering systems. Does the phone have a jack for a regular headset? I am concerned that if something happens to the wireless headset I’ll be out of luck! Unfortunately no it doesn’t. I’m still using the phone, but I gave up on the headset. It’s too fragile. I would like to get a second headband, would you sell me the one you’re not using for 5 bucks? (plus shipping, of course!) we both wear glasses and the over the ear thing is a pain, it would be nice to each have our own headband! I’ve sent you a PM and provided some options for you to get another headband. 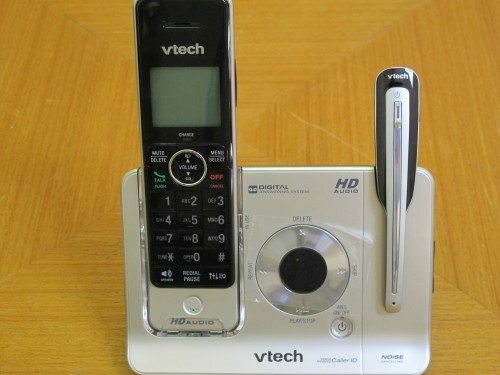 Good after noon fellow V-Tech consumers, does Vtech offer any tech support on the phone??? Anyone have any idea?? ?brain damage… Viet Nam and a sniper?? I spent some time on their web site and it looks like they only provide email support. Can you change the battery of the wireless headset?